Looking for a nice fall hat? Here you can find a free crochet pattern to make the Leafly autumn hat. A video tutorial is included for those who have difficulties reading patterns or just want to see how to make the stitches. If you know how to make a double crochet stitch, this hat will be no problem for you. The pattern works up pretty fast. The leaves are made with the so-called extreme drop stitch – it might sound hard at first, but it really is an easy and fun stitch to make! The potential for colors for this hat is endless, so go ahead and enjoy playing with different colors. Especially when you’re from Canada – or a Canada fan like I am – this hat might be a suitable project for you: use red yarn to create red leaves and you’ll have a patriotic Canada version! Add a pom pom – if you like – to finish it off. For more free designs every day follow us on Facebook. Links to the free pattern and tutorial are below. 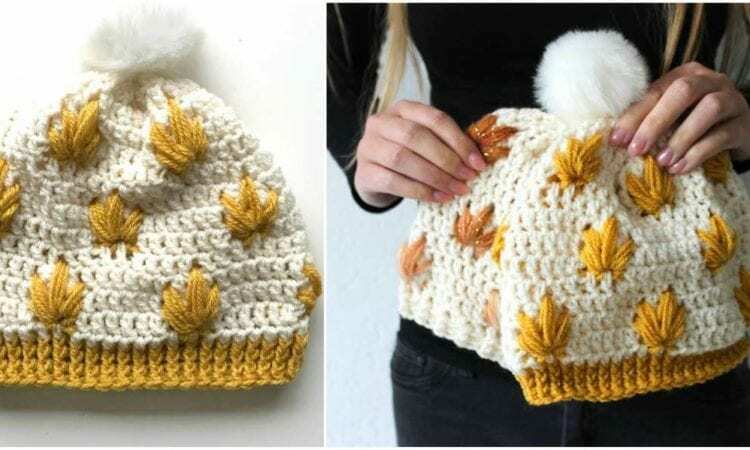 Leafly Autumn Hat – Free Crochet Pattern and Tutorial are here. Don’t forget to Like us on Facebook. Share your ideas and your work on our Facebook group. [Free Pattern] Awesome Slouchy Mesh Hat with Brim.